Ever see a billboard along the highway that has a headline that really gets your attention? What is it about those words or phrases that draw your focus away from the road (for a split second) and make you think about the message? It could be something funny or clever, and maybe it’s “catchy” and something that you will remember. Whatever words catch your attention and makes you think for even a split second is probably a good headline. Most physical therapy practice owners and marketers struggle to find fun and innovative ways to grab patients’ attention while maintaining a sense of authority and professionalism that is needed for a PT. How can you catch a patient’s eye, be creative, and still deliver a clear message? Focus on the headline! If you are creating a flyer for an upcoming open house, the first headline that comes to mind might be “Come to Our September Open House”. Now this does tell the reader exactly what to do, but is it catchy or memorable? How about something fun and engaging, “You’re Invited to ‘Back to School’ Night at ABC Physical Therapy”. It’s personal, seasonal and stands out. Shorter, simpler headlines are easy to read, comprehend, and remember. Try to use at most 6 words to convey your message (excluding words like the, to, with etc. and your clinic’s name). And, if possible, start with a personal word (you, your) or a verb (get, start) to immediately engage the reader. Physical therapy marketing maintains a delicate balance between pain and recovery or injury and prevention. In some cases, such as article headlines or blog posts, a headline with an intentional negative, “Feeling Sore and Achy from Back Pain,” can be a good fit. But for shorter or smaller marketing campaigns: postcards, brochures, or social media, opt for positive messaging, “Get Back to Work Pain-Free!” that encourages or uplifts the reader. These tips might seem like a lot to process—be creative, use the right words, be brief, and stay positive. But try to incorporate at least one of these tips into each marketing piece and see if you notice a better response to your campaign. 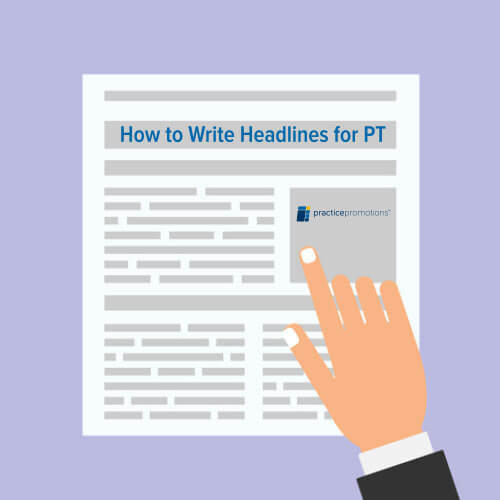 Small changes to your headlines can attract more readers, hold their attention, and prompt them to complete the ultimate task of making an appointment for physical therapy. For more help with writing an effective headline and access to professionally written newsletter and website content, contact us today! We want to help you get the biggest return on investment from your PT marketing.